Quetta – Support of Media and Civil Society was urged in Achievement of Sustainable Development Goals (SDGs) in an advocacy meeting, on Wednesday. 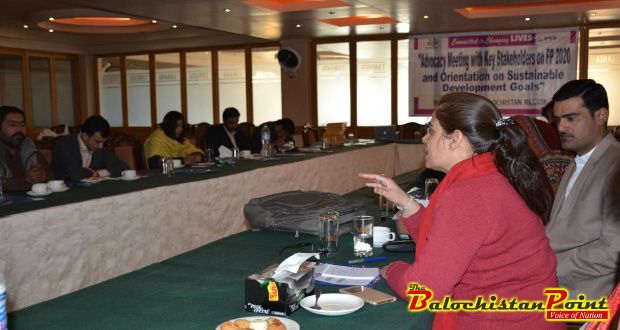 An Advocacy meeting with representatives of Media and Civil Society on FP-2020 and orientation on SDGs was held by Rahnuma – FPAP Balochistan in a local hotel of Quetta. Samina Khan, Member of Provincial Assembly (MPA) and Chairperson of Standing Committee for Education was chief guest of the meeting. “Legislators of Balochistan Assembly only fight for their schemes and that’s why important issues such as Family planning are ignored,” Lamented Samina Khan. Habibullah Khan Nasar, Regional Director Rahnuma FPAP Balochistan presented a detailed orientation on challenges faced in Balochistan for achievement of SDGs. “Current Maternal Mortality Ratio (MMR) in Balochistan is 785 and the targeted MMR in SDGs is 70,” revealed Mr. Nasar. Regional Director Rahnuma FPAP Balochistan also urged media to cover issues of social sector and find a place for them in different forms of news mediums. Mr. Dawood Khan, Provincial Coordinator Rahnuma delivered a presentation about newly approved project funded by Oxfam Novib which focuses on advocacy for child marriage legislation, life skill based education (LSBE) and HIV issues of young people in Balochistan. Rubina Kausar, Regional Program Manager of Rahnuma FPAP Balochistan delivered the vote of thanks.